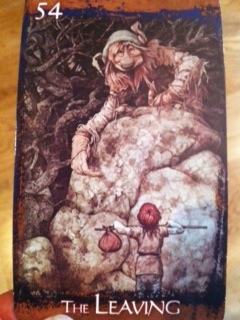 Card: 54 The Leaving – from The Heart of Faerie Oracle deck by Brian and Wendy Froud. “Everything you do, every new endeavor, mean leaving something behind. This can be a place, a person, or even a state of mind. You can’t more forward without leaving some of what you were behind you. This is growth. It is important to acknowledge the leaving of things as you begin your journey. When you leave your house to go on a journey, be it long or short, it is normal thing to tidy up a bit before going. Putting things in their proper places, making sure that the plants are watered and the dishes are washed, is a way of ordering your mind and preparing it to go on to the next step. When you journey psychologically, spiritually, or metaphysically, you will also do well to leave your thoughts in order before you depart on that first step. Just as you would not venture in unknown territory without a map, you would be wise to ask for directions before you leave”. Erin’s Reading: The Faeries tell me that they want me to do the reading for this one, so I guess I’m going to, haha! I looked at this card and totally groaned because it is the card that I, of course, really need right now. I hope that you also get something out of it as well. For the past few weeks I have been experiencing. on both a physical and metaphysical level, a lot changes in my life. The biggest change for me recently is that I have moved into a new home, and I have gone from having roommates to living alone. I am super happy to have my own place and I am really enjoying that process right now, but moving is always a stressful thing to me, and almost every night since the move I have had dreams where I am moving. I have had a few days where I feel quite a bit of anxiety and stress, and the past few days I have been bed ridden because my allergies have been so bad. I know that my being sick right now is tied into my recent stress and my inability to completely move forward. This card is reminding me that I need to let go. In order for me to be in the place that I really want to be in in my life, I need to let got a few things. I need to let go of some unhealthy relationships, some old patterns, and I need to leave the past where it belongs. Most of all, I need to let go of my need to try and control all aspects in my life. This is the most difficult one for me. I suppose the most common term for this is “letting go and letting God”. Haha, the faeries just said “Letting go and letting faerie!” It’s true. If I want to manifest the things I want in my life, I need to stop micromanaging so much and just let the faeries do their magic. I need to spend more time imagining the things I want to create in my life, the type of life I want to have. Just visualize and make it real. If I keep to my old habits of worrying about the future and worrying about other people, it doesn’t really make for time of creation. Letting go of old habits is hard! The faeries reassure me that I can do this, and that I can accomplish my goals, and I can have the life that I want to have. I have a habit of thinking too small, afraid to dream big. Some days I am not convinced that I deserve the best. It’s these old patterns, ways if thinking and relationships that are no longer serving me that I need to let go of. To move forward in a less painful and more joyous way, I need to: Let go. Let go. Let go. The Faeries say: Leave all the unwanted things behind. It’s hard to let go, we know, but if you want to feel good in your forward momentum, it’s the only way. See the small bag the boy is carrying in that card? It’s small to make the journey an easy one. Carrying around lots of baggage would only hinder him and make him miserable. It would make his journey more limited and less flexible. He would always be thinking about the burdensome luggage he was carrying around instead of travelling lightly and enjoying the scenery.